In the bowl of a stand mixer, whisk together yeast, sugar/honey and ½ cup warm water. Allow to sit 10 minutes, until mixture starts to foam. Using the dough attachment on the stand mixer, mix in flour, salt and remaining cup of water on medium speed until a ball of dough forms. Add more flour or water, if necessary. Place a damp cloth over the dough and allow to rise 1 hour. Preheat oven to 425 degrees. Place a pizza stone in the oven to preheat. Dust a cutting board with a little flour. Transfer dough to the cutting board and work to form a flat layer, about ¼ inch thick. Remove pizza stone from the oven and transfer pizza crust to the stone. Brush with olive oil. Spoon and spread pesto sauce on the pizza dough. 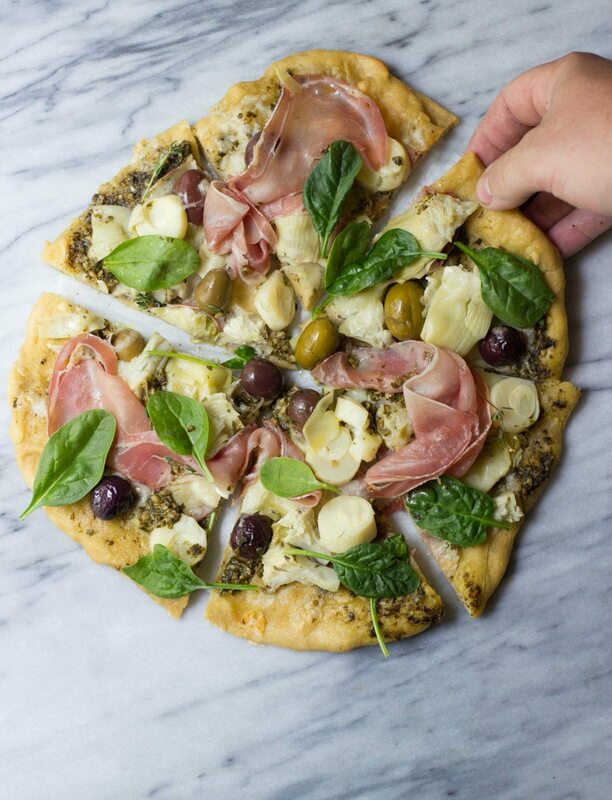 Layer with artichoke hearts, olives and hearts of palm. Sprinkle with fontina. Bake 8-10 minutes, until cheese is melted and bubbly and crust is lightly browned. Allow to slightly cool and top with spinach leaves. Slice and serve.